First major company to factory install Red Hat Linux corporate systems. C-a S (split) command, you can adjust the size with C-a :resize n (n is the number of lines, also +n and -n to add or remove lines). 1. 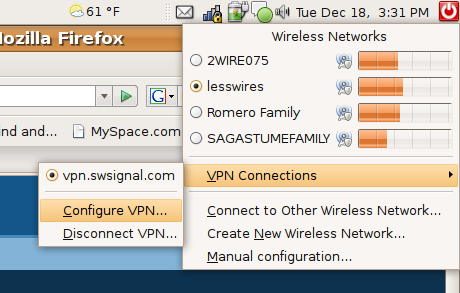 Select Configure VPN from the panel icon. 6. Add your routes for your remote site. In my case I used “10.0.1.0/24 10.0.2.0/24”. Separate mutliple entry by a space. I had a buddy who had his home folder also setup as his desktop, and was frustrated because he didn’t know how to fix it. There is a file located at “/home/yourfolder/.config/user-dirs.dirs”. You edit this file to point your common folders for where ever you would like. Many of you know and love Clark Howard, and all he does to help his listeners & readers “Save more, spend less and avoid ripoffs”. He was signing books last Saturday at my local Costco, and I thought this would be this perfect opportunity to talk with him about open source software. How better could his listeners save money that to use OpenOffice.org? When it was my turn for him to sign my copy of the book “Get Clark Smart” , he immediately noticed my Firefox t-shirt, and commented that he didn’t know they made such a thing. What a great start!!! He knows Firefox, what else did he know? I told him that I was very big into open source software, and he mentioned that he uses OpenOffice.org and hasn’t had any problems with it. He did say that one of his team members didn’t like it because it wasn’t interpolatable with MS Office. Clark Howard then mentioned that he really liked Spybot-S&D for anti-spyware. I told him that I didn’t have to worry about spyware since I used Linux. He mentioned that he used to have a Linux box, but got rid of it, because his wife didn’t like it. I told him that he should try Ubuntu, and Linux has improved a lot on the desktop. He mentioned the only problem with OpenOffice.org is that it takes to long for people to download. I told him that I would love to see OpenOffice.org at Costco. Since it is free to distribute. Costco could charge $20 or $30 dollars, and every one would be happy, and customers would have plenty of money left over to buy other things. (As opposed to MS Office). This is one of my goals…. to somehow distribute OO at Costco. So if anyone would like to help me distribute OO at Costco, please let me know. I have been using Linux as my desktop operating system off and on since 1998, and exclusively for the past year. It is far from perfect, but I love it and think everyone should at least check it out. In preparation for my Linux only lifestyle, I tried to only use software that was cross platform (Windows & Linux). It has been nice to see desktop software mature in the GNU/Linux world. Not everyone is able to take advantage of what Linux has to offer, but there are many open source/free applications for Windows that are worth taking a look at. I use all of these applications and an fully endorse them. The game’s website describes it as this… “What’s GNU?” The three-letter-word race game that spells FUN! The object of the game is to spell more three-letter words than the other players. Up to 36 Word-Starter cards, which have one letter provided and two blanks, are spread out for everyone to see. Players slide the clever Letter Getter to magically reveal two letter tiles. Kids then must look at these tiles and try to make three-letter words by filling in the blanks on the Word-Starter cards. The player with the most three-letter words when all the tiles run out wins! Building your vocabulary is three times more fun with What’s GNU? For 2 to 6 players. Unfortunately my son is just a little too young for spelling, so we went home with a Mr. Potato Head instead. I should have bought it anyways and put it in the closet until he is old enough to appreciate it. It is also unfortunate that the “What’s GNU?” website is written in ASP.NET which is not a GPL language. Oh well! It is still cool, and everyone should run out and buy it for their 5-8 year old! I recently have been making a lot of improvements to my family website. On of the most requested features is a family history/genealogy section. After reviewing most of the GNU/PHP genealogy web software solutions, I chose to go with PhpGedView. I was able to easily upload my Sister’s GENCOM file, and everything just worked.